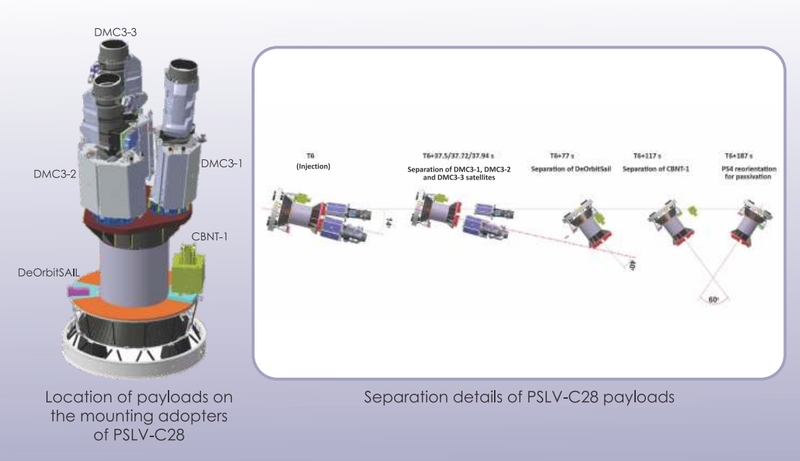 ISRO will launch 5 British Satellites on behalf of Antrix Corporation (which is ISRO’s commercial arm) on board the PSLV-C28 vehicle on July 10, 2015. This is the PSLV’s 30th mission. ISRO will use the PSLV’s Extended Length (XL) variant to launch 1440 kg payload consisting of 5 British satellites into orbit. The 5 satellites are the Surrey Satellite Technology Limited’s (SSTL) DMC3 satellites and CNBT-1 satellites and the Surrey Space Center’s DeOrbitSail spacecraft. 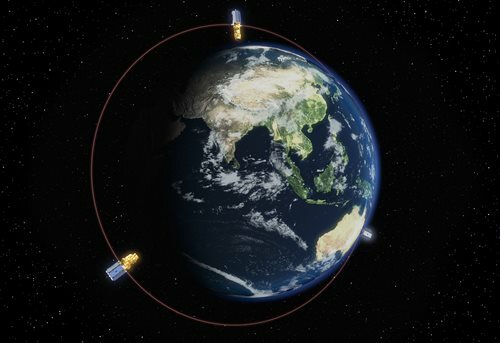 The DMC stands for the Disaster Management Constellation of 3 satellites built by the SSTL for it’s wholly owned subsidiary, DMCii (DMC International Imaging Ltd) which is executing this project for a Chinese company, 21AT. The DMC constellation is a group of 3 small satellites placed in orbit 120 degrees apart, as shown in the image above. The idea is to quickly image areas which have been struck by disaster with high-resolution cameras (1 m resolution) with a capability to provide very fast down link in order to help make the images available quickly in order to assess damage and plan disaster response. I could not read much about this satellite but it seems that the company that built it, SSTL will share more details after the launch. All that is known for sure right now is that it weighs 91 kg and is a technology demonstrator mission. This is an interesting 7 kg 3U cubesat with dimensions of 10 x 10 x 34 cm. It contains a highly densely packed 4 x 4 meter sail which will be deployed in space in order to increase drag in order to cause the spacecraft to deorbit and return back to Earth. The project is developed by the Surrey Space Center (not the same as SSTL). 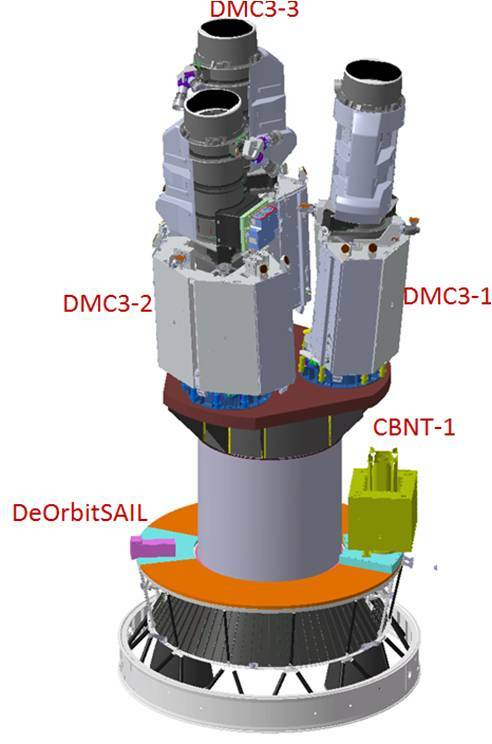 For ISRO, the challenge begins with the three DMC3 spacecrafts. It had to fit in these 3 satellites each of which has a length of 3 meters into the 3.2 m diameter, 8.9 m long payload fairing of the PSLV-XL. They resolved the issue by changing the launch adapter. A launch adapter is basically a platform on which the satellites are kept and launched from once the last stage of the PSLV reaches the designated orbit and orientation. The vehicle uses a new launch adapter which has a triangular deck and is called the Multiple Satellite Adapter – Version 2 (MSA-V2). A success now will help cement the PSLV’s record and hopefully bring more business Antrix’s way. This launch shows that even commercial launches can make requirements on a proven launch vehicle that if managed would improve the agility of the variety of satellites that the PSLV is capable of putting into orbit. This agility lowers cost and enables Antrix to reach a wider market to sell launches on the PSLV. Wishing ISRO Godspeed.